While many woodworkers crave the quiet and isolation of time alone in the workshop, I personally find it a little lonely sometimes. Sure, it is a nice release from the busyness of the day, and I appreciate the time to be alone with my thoughts. I also really like the self-reliance I develop when there isn’t anyone around to ask how to do something, and I just have to figure it out for myself. Still, a friendly face and a bit of personality can make your time in the shop more enjoyable, and while catching up on my woodworking blogs, I ran across an older blog post by Kari Hultman, The Village Carpenter, where it appears she has found a happy medium between a quiet wood shop with, as she puts it, “a quirky crew” of wooden planes to keep her on her toes. Included in her wonderfully entertaining description of each of her plane’s bizarrely human characteristics is the romantic notion of having a wooden hand plane you’ve owned and used for many years develop a thumb indentation on its side. I love this idea, and it makes me wonder if I’ll ever do enough woodworking to achieve this? The Ron Hock Wooden Plane Kit, a Krenov-style Jarrah plane kit that includes all the pieces ready for assembly. There’s even a video at that link showing Ron Hock himself assembling one of these planes. Making Traditional Wooden Planes, a fascinating book that offers plans for 20 different wooden planes, as well as some great history lessons and helpful information about maintaining your wooden plane once you’ve made one. 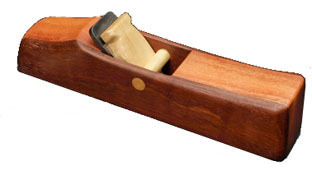 Lee Laird’s two-part blog post about making his own wooden plane. In this series, Lee Laird goes through all the steps he took to make a wooden plane, and proclaims it to be a great solution when you can’t find the exact plane that you need. About 32 minutes ago from Highland Woodworking's Twitter via Hootsuite Inc.